With the progress of the industry 4.0 and Industrial Internet, not only the improvement on performance and operability is required, the improvements on high-speed and opening of the network environment, safety of devices, security and etc. are also turning to be more and more necessary. As an answer for all these requirements, Renesas offers optimum solutions targeting Programable Logic Controller , remote I/O and Ethernet Switch. Furthermore, solutions for high operability and visibility are also prepared. 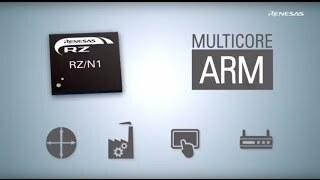 In the below link, Introduce Renesas recommended devices and solutions. Browse block diagrams for control applications to see how our devices could be used in your next project. Programmable logic controller (PLC) are used to control industrial machinery such as AC servos, general-purpose inverters, and sensors. They are widely used in factory automation systems for manufacturing and processing lines, machine tools, and industrial robots. To provide control capabilities tailored to each individual system, modular PLCs (CPU unit and various peripheral units) are used for large-scale and midsize systems, while block PLCs (CPU unit only) are used for small-scale systems.